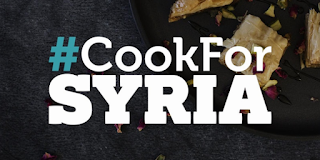 .On Thursday 15th March the KinoVino supper club is holding a special event at the Institute of Light in London Fields to raise money for both the #CookForSyria and REBUILD charities. Guest chefs will include Melissa Hemsley, Henrietta Inman, and Zoe Adjonyoh from Zoe's Ghana Kitchen, plus there will be a screening of the documentary 'I Want To Live'. Tickets cost £60, with proceeeds going to both charities. Please support this! "KinoVino, London’s unique cinema supper club, brings you a special charity edition raising money for #CookForSyria and REBUILD. With this event, we’d like to give you a more intimate glimpse into the lives of ordinary people in Syria with a screening of ‘I Want to Live’, a beautiful and moving documentary, and offer you a chance to savour the flavours of the region, to celebrate the vibrant and resilient food culture, where the act of sharing food and communal eating is the act of living! We will bring together some of UK’s most remarkable chefs who, marrying Kurdish, Syrian and Middle Eastern cuisines, will each create a dish for our feast. All profits from the event will go to #CookForSyria and REBUILD"